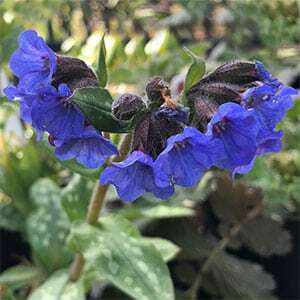 Regared as one of the best varieties Pulmonaria saccharata ‘Highdown’ is a rhizomatous perennial with very attractive flowers. The foliage is nicely patterned and this is an easy care plant in a shed position. Excellent when planted in clumps in a woodland garden or a shaded part of the general garden border. If prefers a moist soil to grow well. Common Name – Pulmonaria ‘Highdown’, ‘Lewis Palmer’. Soil – Best suited to a humus rich moist soil. Spread – Forms a clump to .5 metres. Foliage – Green with greenish yellow markings. Drought tolerant – Low to medium.